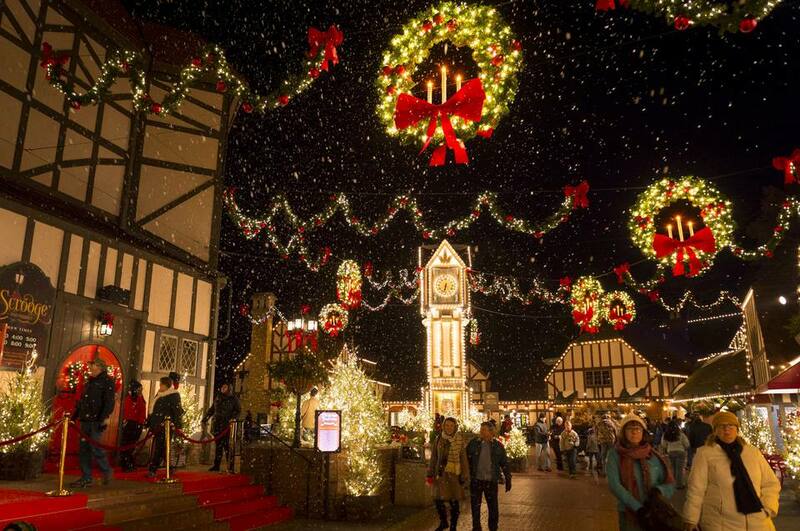 "Christmas Town: A Busch Gardens Celebration," transforms the Williamsburg, Virginia amusement park into a Christmas wonderland, combining an immersive holiday experience with one-of-a-kind shopping and dining opportunities, holiday shows, and a spectacular light-dancing Christmas tree. This is a fun way to enjoy the holiday season with the whole family. Dress for the weather and wear a good pair of walking shoes. In the spirit of giving this holiday season, guests are invited to bring an unwrapped toy to the park. All toy donations support the Hampton Roads Toys for Tots chapter so local families can have gifts to unwrap on Christmas day. November 17, 2018 - January 5, 2019. Closed on Christmas Day. Open 2 - 10 p.m. during the week and open 12 noon - 10 p.m on Saturdays, Sundays, and during the holiday week. Some sections of the park will remain closed for the season, and some rides and attractions are weather dependent. A Christmas Town Tree Lighting Ceremony will open the season. The lighting ceremony celebrates the arrival of the holiday season and will culminate with the synchronized lighting of the park’s eight million Christmas lights. Stroll through bustling European town squares (England, France, Ireland, Scotland, and Germany) complete with carolers set amid traditional greenery, classic red bows, holiday lights and candles glowing in every shop and restaurant window. Smell the aroma of holiday treats and enjoy hearty soups, smoked meats, fresh baked holiday cookies, and peppermint hot chocolate. Visit the Abbey Stone Theatre for an all-new Christmas show with moving imagery, choral harmonies, and a full live orchestra. Dine with Santa and Mrs. Claus and have your picture taken with the jolly old elf. Explore an ice-themed world with dazzling lights, falling snow and an up-close encounter with live penguins at the Royal Palace Theatre. Visit Santa’s workshop at the North Pole to meet St. Nick himself before heading to Oktoberfest to view Virginia’s tallest lighted Christmas tree. This 45-foot LED tree stands taller than Das Festhaus and features computerized lights that dance and change color during special evening light shows. Enjoy a spectacular light show “O Tannenbaum,” featuring a 45-foot, light-animated Christmas tree and be immersed by the dazzling sights and sounds of the booming symphonic score destined to become a Christmas Town tradition. 2018/2019 Ticket options include one or multiple-day admissions and packages including visits to Colonial Williamsburg. Guests with active Busch Gardens passes save 50 percent plus free parking and in-park discounts. Vacation packages with including accommodations and entry to Christmas Town are also available. Busch Gardens Williamsburg.- Take Interstate 64 West to Exit 243A. The amusement park is located three miles east of Colonial Williamsburg, Virginia, approximately 150 miles from Washington, D.C.
Busch Gardens is a 100-acre European-themed amusement park with 17th-century charm and more than 50 rides and attractions. The park is located in the Historic Triangle of Virginia that boasts a wide variety of attractions including historical sites, amusement parks, shopping, fine dining and much more.